Posted on Sun, Mar 4, 2012 : 3:52 p.m.
After its 71-65 win at Penn State on Sunday afternoon, the Michigan basketball team has a chance at sharing the Big Ten title. For that to happen, Ohio State has to beat Michigan State in East Lansing (4 p.m., CBS). The team will be scoreboard watching during its return trip from State College, Pa. 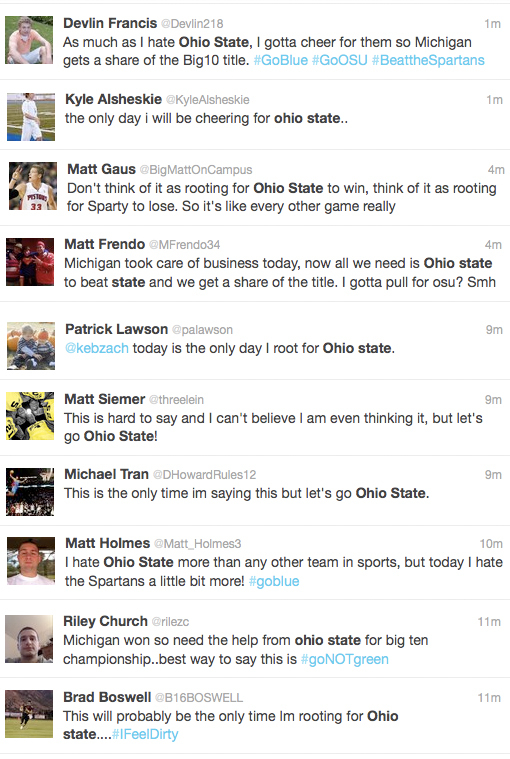 Meanwhile, Michigan fans are feeling a little uneasy about rooting for the Buckeyes. Judie Spiro Scranton: (rooting) for ohio makes me feel nasty - but I will do it for the sake of the team! Brad Hillard: Little brothers should share EVERYTHING with their big brothers! Hahahaha! Share your sentiments in the comment section below. Sun, Mar 4, 2012 : 11:50 p.m. I will never tell my future children that I have once said, &quot;Go Ohio State.&quot; My soul feels dirty... But glad Michigan can bring home a piece of the championship! Sun, Mar 4, 2012 : 11:49 p.m. I can smell the couches burning all the way out here in New Mexico... GO BLUE!! !